The Penthouse is a stunning property in the most prestigious area of Costa Teguise. It is faced to see beautiful morning sunrises over the sea and bay of costa teguises famous beach, las cucharas. As shown on the pictures the beach is only a stone throw away. We have created a home from home with a mix of canarian and modern arquitecture. The bathroom has a walk in shower ( 4 by 5 feet wide ) which features seating facility to enjoy the tropical shower head, and wooden sink cabinet. There is a fully fitted kitchen including coffee machine, toaster, ceramic hob and fridge/freezer. The lounge area offers a marble breakfast and wine bar, 40 ' LCD falt screen with satellite TV, sky news etc. There is an inside dining area and a large leather sofa area which accommodates min 3 people. The main bedroom also offers a walk in wardrobe to store all your necessary belongings and clothes whilst enjoying your holidays. The outside area offers a private walled terrace, complete with outside lounge furniture, The highlight is the Balinese Canopy Bed with sea & beach views. Enjoy reading a book or the Free Wifi surfing the Web whilst relaxing and letting the world go by. 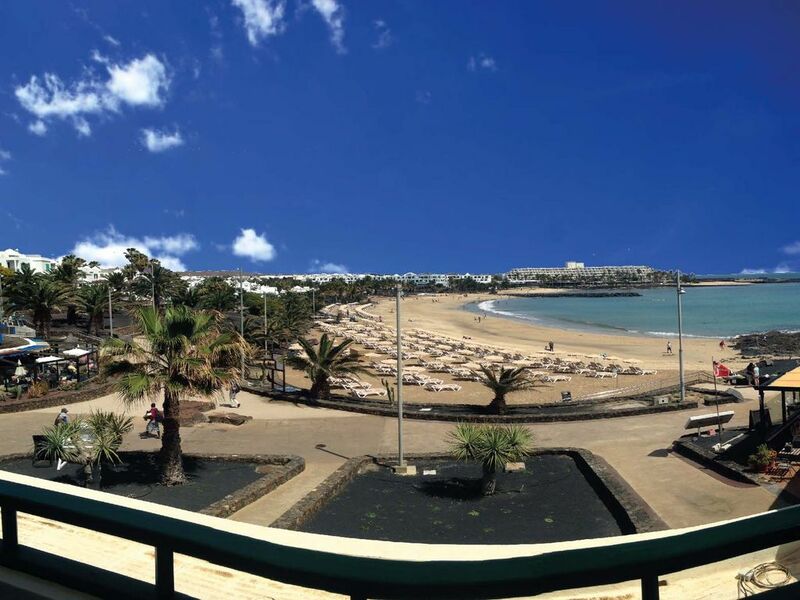 The Penthouse is within walking distance to all the local amenities, including supermarkets, bars, restaurants, tourist shops and the wonderful sandy beaches, where there are sun beds, umbrellas and water sports available. A car is not necessary, however, if you would like to explore the Island, there are plenty of car hire facilities available or alternatively the local bus service. After studying at Plymouth University I went to work in Germany, where I meet my wife. We then decided to move to lanzarote to open a business. We have lived on Lanzarote over 6 years now. Both our daughters are born on this beautiful island and are now going to primary school. We have bought the propperty in Costa Teguise because I used to come here with my parents when we did not yet live on lanzarote. It used to be our holiday resort for many years, before we moved to lanzarote. It is situated in a perfect location in Town, away from noisy hotels. You don't need a car or taxi as everything is within walking distance. When we first purchased the propperty it was like many others in town!!! I have refurbished the beach house with a professional south amercian builder who specialized in stone building. We wanted to offer a holiday home of very high quality for couples that like individual holiday, away from All inclusive Hotels. What has come out is a unique Penthouse that is build in local natural stone, recycled wood and uses solar energy. Our intention was to enjoy and spend as much time outside as possible, as the weather is warm all year round. To make this happen we have created an outside lounge area for reading and relaxing under sun and palm tree. Centrally located only 10-15 from the airport and within an easy walk to restaurants, shops, bars, cycle and car hire. The Spar shop is 1 minute walk away. The balcony is north facing so not much sun but there is the beach just a few steps from the apartment block. We did a lovely cycle ride along the coast to Puerto del Carmen and hired a car from the shop just below the apartment to tour the island. We had a lovely short break. Beware it gets chilly in the evenings in February but we had great sunny days. We would recommend this apartment to couples and small families. Great apartment in a great location if you want to be central for bars and restaurants. The sea view from the apartment is second to none. Very well equipped and has everything you need for a week or two and would certainly come back next time we are in Teguise. Couldnt have asked for more!! Had a fab time staying at the Beach house! The Beach House was lovely,the location and view was fantastic. Would certainly recommend staying here! having the Airport transfer was a Bonus....All in all a very stress free holiday! Have already booked for next year!! Couldn't have been any better. Facilities in the apt were excellent bathroom really good, quiet no street noise and view from the balcony excellent, not really a problem but you don't get the sun all day on the balcony, Giles was a pleasure to deal with! We arrived early so went for a drink while it was getting cleaned and ended up in Giles restaurant un known to us! He bought us our first drink in Lanzarote. Just arrived, and simply lovely. Right at the heart of where you want to be. Clean, lovely comfy beds and duvets! Yeah.. Far more comfortable than the hotel I stayed in last time! A beautiful apartment in an incredible location. The view was fantastic and this apartment was easily one of the most well appointed we have ever stayed in. Absolutely everything you would need was provided right done to washing up liquid. The balcony was done out beautifully. There was a lovely hamper provided on arrival with fruit, snacks, milk, bread and bottle of wine. Everything was on your doorstep, no need to traipse to find shops, bars restaurants. We have stayed in " Diamond Resort " complexes before, the last one being in Vegas and they are first class, however would rather have this one. To make our price policy as easy as possible we only apply 1 price which is 75 euros per night all year round. We believe its not right to change price and charge more money in high season. The price is based on up to 2 guests sharing the Beach House. The 3rd person will be charged an additional 5 euro per night.